ATLANTA -- A dreary day in Atlanta got that much drearier for dozens - perhaps hundreds - of visitors downtown, Sunday. That's because, when they arrived to the parking lot across from the World of Coke and the civil rights museum they found their cars booted. "A gentleman waved us on, told us there were several events going on," St. Louis visitor Sherry Blacklock said. "They had people standing in the kiosks at every entrance saying we had to do this. 'It's a little bit more today and you have to pay us and they gave us a ticket and we put it in our windshield.'" In fact, the car owners said they paid double the price to park here believing they were getting a deal because of the crowds in town. They said everything looked legit - from the attendants' khaki uniforms to the tickets. "There were signs saying event parking and there were gentlemen by the road and another in further here at the parking lot waving us in," Barbara Wright of Asheville, N.C. said. "When we got to the second guy he said park right in here." But later, once they spotted the boots on their vehicles, the victims began to suspect they had been hustled - paying $20 each for special parking and $75 to get out of the special parking. "It's hard to imagine that the lot owner had someone in the booth while two other people were working his lot collecting cash money and you could see them collecting cash money in broad daylight and not know doing anything about it," one victim said. "And now they've come around and booted everybody in the lot here." Police took reports at the scene but it's not clear whether that will help recoup their money. "I'd like to have my car since we did pay for parking," another victim said. "It's private property and it's not up to me to prove who the parking people are if they actually do belong here." 11Alive reached out to the "Parking Company of America" and "Peachtree Parking Solutions" to get their response to the complaints without success Sunday night. 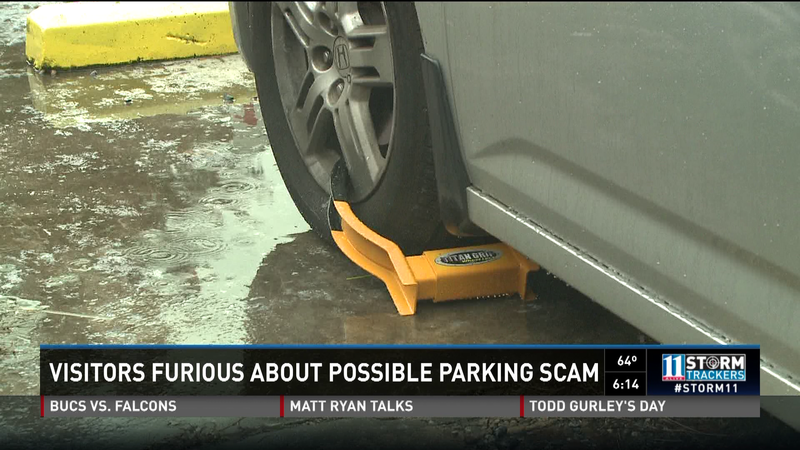 The victims said there's got to be a better way to catch impostors using real parking lots.